In the 1989 comedy Bill and Ted’s Most Excellent Adventure, aspiring musicians Bill and Ted find themselves journeying through time in order to pass their final history exam and to secure the destiny of their future band “Wyld Stallyons.” Along the way, they collect and transport the following “historical personages” to 1988 San Dimas, California: Socrates, Genghis Khan, Joan of Ark (not Noah’s wife), Napoleon, Beethoven, Abraham Lincoln, Billy the Kid, Sigmund Freud, and two random princesses. It’s fun to think about who you might have chosen. Who are a few key figures who have influenced how nations have risen, how kingdoms have fallen, how academic disciplines have been practiced, how musical genius has been defined? In Classic Christian Thinkers: An Introduction, Kenneth Richard Samples has selected individuals of both profound thought and lasting impact who guided the formation of modern Christendom. These academics collectively made contributions to the sciences, literature, philosophy, as well as theology. They spoke on the weighty themes of theism, the nature of Christ, and the state of humanity. At critical times in history, they reflected deeply on the canon and sought to communicate orthodoxy in the midst of conflict and heresy. Samples’ selections? Irenaeus (c. 130-202 AD), Athanasius (296-373 AD), Augustine (354-430 AD), Anselm (1033-1109 AD), Thomas Aquinas (1225-1274 AD), Martin Luther (1483-1546 AD), John Calvin (1509-1564 AD), Blaise Pascal (1623-1662 AD), and C.S. Lewis (1898-1963 AD). Church history is not just a recounting of facts, dates, and personalities. It is about how real people authentically engaged the theological challenges of their time and left a lasting legacy by which we can bolster our own faith today. Their musings leave a historical record documenting some of the most influential Christian thought on key doctrines. A refreshingly irenic book, Classic Christian Thinkers focuses on those writers whose insights are often valued across Orthodox, Catholic, and Protestant lines of demarcation while not ignoring or discrediting legitimate differences. Did these men get everything right? No. But they effectively communicated rightly about some of the most important and debated Biblical questions of their time. There is nothing new under the Sun. We are not starting from scratch. There are those from whom we can learn. Let us not repeatedly fall into the same errors of past generations because we are living as intellectual paupers while simultaneously drowning in a flood of ephemeral information. Samples showcases the lives of saints and scholars that many have forgotten yet who still have much to say that is relevant today. Perhaps therein lies the greatness of their works and why their writings have endured. They prove that thinking matters. How has the Church changed over two millennia? How have doctrines concerning mysteries such as the Trinity, Incarnation, and Atonement developed over time? 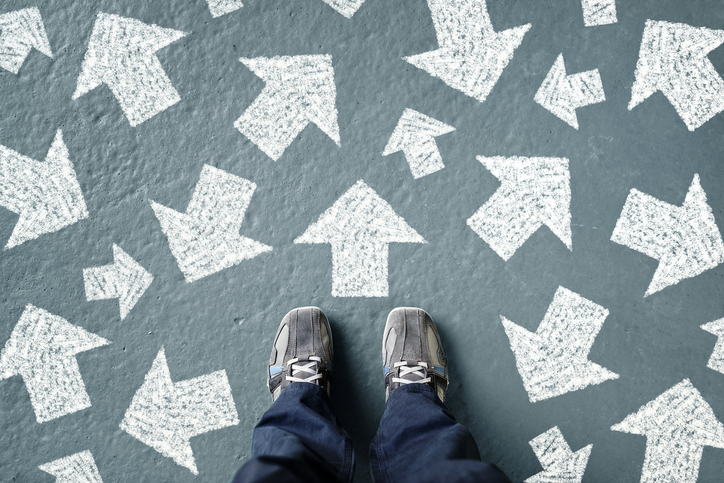 How has Christendom stayed the course? As noted in the subtitle, this book serves as only an introduction. May this survey inspire and encourage new thinkers, writers, philosophers, and apologists to read more classic works and be transformed by them for, in the end, orthodoxy informs praxis, and a life well-lived in Christ is perhaps the best apologetic argument of all. Most people would characterize Hugh Ross as a scientist – and that he is. Typically, his books are saturated with scientific detail with many, many pages dedicated to the citation of referenced publications. Indeed, he could not resist including a summary of what he considers to be the most important scientific evidences of the Christian faith; however, most of the book is about a side of Hugh Ross that gets less public attention. He is, in fact, a pastor, and in Always Be Ready we learn how he has applied the rigor of the scientific method (not just scientific facts) to his evangelistic efforts. We find that Ross is an evangelist who was never evangelized. 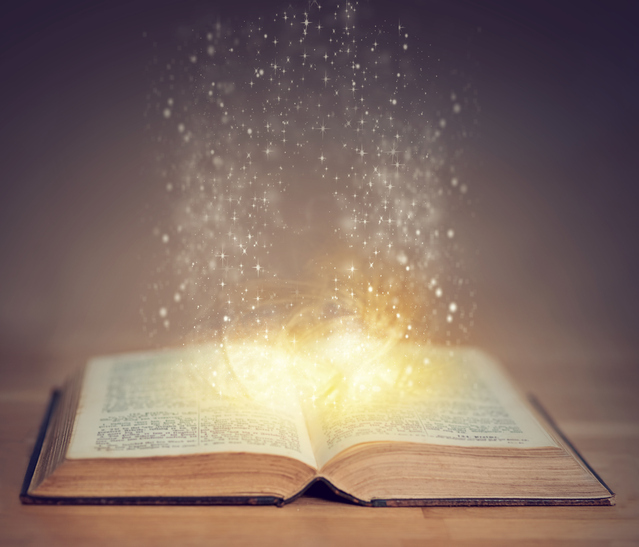 Rather it was science that introduced him to his loving Creator, and it was the Christian Bible that stood out among the world’s other holy books to woo him towards a consummating commitment to Jesus Christ. In addition, he is a communicator who overcame communication challenges associated with autism. The stories that emerge are nothing short of miraculous and many of them qualify as full-fledged adventures. What happened when the president of a school’s Atheist Club converted to Christianity one-the-spot during a science apologetics presentation? Can door-to-door visitation be successful? Is it too late to share Christ with someone in a coma? How can a church respond to the presence of an adult bookstore in the neighborhood? What questions regularly invite meaningful and respectful dialogue? What role does hospitality play in apologetics? Ross gives some very practical advice about how to improve your own ministry to those around you in a winsome way. Some of his ideas and approaches might be new to you, but by the end of the book you realize that he does many things that are not new at all. He believes that God is already at work in the lives of those he encounters. He welcomes questions from skeptics. He joins together with other Christians. He uses his strengths and learns from his weaknesses. He simply takes 1 Peter 3:15 seriously. Read this book if you are a skeptic of Christianity who wants to better understand its attraction. Read it if you are a Christian who wants to be simultaneously encouraged and challenged. Terrorism. Tragedies. Fake news. Allegations. It’s time to avert your eyes from the anxiety-producing online commentary that drives you to distraction. Turn off your mobile. Sit back and wonder. Look at points of light in a dark, night sky. Was our universe – everything we see and know – inevitable? Is it by chance or by purpose that you consider this question? Reclaim control of your faculties, and contemplate your place in the cosmos. A seven-year-old, budding astronomer named Hugh Ross looked to the night sky more than six decades ago and asked, “Are stars hot?” A prolonged pursuit for answers set him out on an academic quest, not only into space, but into the past and beyond. 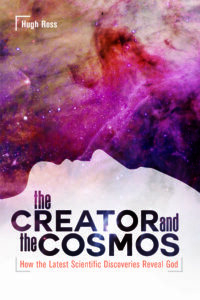 Dr. Ross’ newly released 4th edition of The Creator and the Cosmos is an ardent scientific defense of Big Bang cosmology and a call to consider its implications on a personal and spiritual level. Like me, you may be surprised to learn that the Big Bang Theory requires a defense at this point. After all, it has not only been well vetted by the mainstream physics community, it has passed into the vernacular of popular culture via the title of a popular sit-com. Nevertheless, the most celebrated minds of science still endeavor to know exactly how our universe came to be, and they engage in vigorous debate to that end. After all, the how may imply a why. The Big Bang is not just a tacit affirmation of “In the beginning…”; it is a theory that leads us to the possibility of a transcendent Creator via the scientific method rather than in spite of it. Its seemingly incontrovertible implications are both profound and unsettling to anyone who believes themselves to be well-ensconced within the fortress of philosophical naturalism. Once 20th-century scientists determined that the universe was inexorably expanding, they could then begin to retrace its early development. Ross reviews a litany of discoveries that permitted scientists to see further and further into the past with increasing clarity. Having retreated so far, they now find their backs up against a single point that defines the boundary of all that is known. Will they now turn and face that which is beyond? The realm that spawned a pluripotent singularity that differentiated into all the space, time, matter, and energy that we experience? A First Cause that set it all in motion? Dr. Ross very effectively couples physics with Christian evangelism until, under the duress of the data, the intellectually honest skeptic must at least consider that something supernatural is afoot in the universe. This new iteration includes over 70 pages of new content, and the discussion questions at the end of each chapter invite readers to engage in intellectually and theologically rich discussions. Still have doubts at the end of the book? Check out the appendices and online compendium listing hundreds of finely tuned parameters for life. Or, alternatively, just proceed to 30 years’ worth of research compiled by Christian scholars at reasons.org. How do we know that the universe is expanding? Does the quantum eternity theorem offer a viable alternative to a cosmic beginning? Why might atoms never have existed, and why must life be carbon-based? Why does our solar system’s location in the galaxy matter? How does a comparison of Earth’s extinction rate with its speciation rate support a Biblical view of creation and pose problems for the macroevolutionary paradigm? Why is a 13.8-billion-year-old universe insufficiently old to support naturalistic origin-of-life scenarios? Why was it advantageous for the Holy Spirit to come to believers after Christ ascended from Earth? The book is written from an old-earth creation perspective that does not support macroevolution. It primarily addresses the concerns of skeptical scientists as well as scientifically literate laypeople within the church. Young-earth creationists may want to venture out and examine this book or other RTB reads in order to explore the robust scientific support for the old-earth position as well as its moorings to an inerrant interpretation of Scripture as affirmed by the Chicago Statement on Biblical Inerrancy. While the SETI Institute still awaits transmissions from intelligent life beyond Earth, the stars have been speaking all along. It is from their language of light that physicists continue to decipher the story of the universe and how it relates to life here on Earth. Tonight, resist the seductive siren call of your cellular device. Look to heavens and be reminded of their enduring and ancient declarations: There is a Creator of the cosmos, and he is the Creator of you. Remarkably, DAP can phosphorylate three distinct types of biologically significant molecules: nucleosides/tides, amino acids, and lipid precursors. Adding phosphoryl groups to these molecules allows a progression of chemical reactions necessary to advance bottom-up OOL scenarios. DAP reacts with these diverse prebiotic molecules so that they may further assemble into larger biologically significant molecules: oligonucleotides, peptides and liposomes, respectively. Furthermore, DAP’s phosphorylating reactions occur readily, not requiring condensation reactions to drive particular chemical processes to completion. To their credit, the research team carefully crafted their experimentation using as many plausible prebiotic reagents and primordial conditions as possible. Even so, the initial DAP reagent was synthesized from the “prebiotically available trimetaphosphate by reaction with ammonia, at relatively high pH.” This synthesis is problematic since ammonia levels were very low on the early Earth3 and because the subsequent experimentation was carried out in neutral conditions. The scientists acknowledge that alternative DAP production pathways should be sought out. Intelligent agency, courtesy of the research team, is still a de facto catalyst in these reactions. It is also important to note that although the experimental conditions were similar for each synthesis, the various molecular assemblages were all acquired separately. The researchers later hypothesized that “the commonality of conditions for the oligomerization [assembly] of different building blocks suggests that productive and mixed chemistries might be possible.” On the other hand, mixed chemistries might compete or otherwise prove to be detrimental, yielding undesirable products that interfere with the production of the targeted compounds as well as with the original experimental conditions that have been so carefully standardized. Robust reactivity can both work for you and against you in a chemical milieu. As previously noted, genetic information is required to invoke and sustain adaptation. The OOL-linchpin molecule, RNA, is quite fragile and relatively short-lived as a “naked replicator,”7 but intact RNA seems to operate quite well within its wide variety of living hosts. As clearly demonstrated in extremophiles, the hardiness of a whole organism is greater than that of its constituent parts. In this way, homeostatic mechanisms appear to be irreducibly complex and are only afforded the fully viable entity. Just as the DAP-induced liposomes do not necessarily become biologically responsive phospholipid bilayer membranes, DAP-induced assemblies of sugars8 and nucleotide strands do not necessarily form self-replicating molecules, much less bio-relevant information. Likewise, the selective phosphorylation of certain amino acids may not necessarily lead to the production of bio-functional proteins. In naturalistic terms, there is absolutely no reason for chemicals to preferentially tend towards increased complexity in an ongoing fashion, and there can be no meaningful form of natural selection until a reliable replication system is in place to reproduce favorable selections. In the end, the phosphorylation and subsequent oligomerization reactions made possible by DAP might lead to the rapid, concurrent assembly of some potentially useful cell components. Top-down OOL researchers, who already possess all the fully developed cell components, know that the complete assembly and arrangement of the parts is another very real OOL challenge. At the most basic level, there is no naturalistic reason for any chemistry-enabling atom (phosphorous or otherwise) to exist at all. Why should the Big Bang have yielded anything more than widely distributed, discrete subatomic particles or, alternatively, nothing more than all-consuming black holes?17 If mainstream physicists can accept the existence of additional dimensions beyond our experience18 or multiverses beyond our detection,19 why then is it unscientific to consider that life’s source of information and irreducibly complex design features might lie beyond our full apprehension? At an intuitive level we sense that materialism’s mechanisms are more reductionist than rational, and a DAP fairytale featuring molecular characters does not suffice. There is no reason to expect a purposeless naturalistic process to ultimately produce an organism that seeks to understand its origin, but we humans insatiably seek our story — our grand meta-narrative in which both mystery and meaning ring true. The fact of life’s origin is incontrovertibly grounded in realism, yet its veiled narrative is as mystical a fairytale. Only the concurrent immanence and transcendence of Christ the Creator can reconcile these seemingly divergent storylines into a unified plot that accounts for the harshest of realities while eagerly awaiting the happiest of endings. He is the only satisfying denouement in a drama truly Divine. 1 Scripps Research Institute. “Potential ‘missing link’ in chemistry that led to life on Earth discovered.” ScienceDaily. www.sciencedaily.com/releases/2017/11/171106112301.htm (accessed December 7, 2017). 2 Clémentine Gibard, Subhendu Bhowmik, Megha Karki, Eun-Kyong Kim, Ramanarayanan Krishnamurthy. Phosphorylation, oligomerization and self-assembly in water under potential prebiotic conditions. Nature Chemistry, 2017; DOI: 10.1038/nchem.2878. 3 Fazale Rana and Hugh Ross, Origins of Life: Biblical and Evolutionary Models Face Off (Covina, CA: Reasons to Believe, 2014), 105. 4 Fazale Rana, The Cell’s Design: How Chemistry Reveals the Creator’s Artistry (Grand Rapids: Baker Books, 2008), 273. 7 Fazale Rana and Hugh Ross, Origins of Life: Biblical and Evolutionary Models Face Off (Covina, CA: Reasons to Believe, 2014), 90-1. 8 Krishnamurthy, R., Guntha, S. & Eschenmoser, A. Regioselective αphosphorylation of aldoses in aqueous solution. Angew. Chem. Int. Ed. 39, 2281–5 (2000). 12 Fazale Rana and Hugh Ross, Origins of Life: Biblical and Evolutionary Models Face Off (Covina, CA: Reasons to Believe, 2014), 96. 13 Wikipedia contributors, “Peak phosphorus,” Wikipedia, The Free Encyclopedia, https://en.wikipedia.org/w/index.php?title=Peak_phosphorus&oldid=805719116 (accessed December 8, 2017). 14 Wikipedia contributors, “Phosphorus,” Wikipedia, The Free Encyclopedia, https://en.wikipedia.org/w/index.php?title=Phosphorus&oldid=814149017 (accessed December 8, 2017). 15 Fazale Rana and Hugh Ross, Origins of Life: Biblical and Evolutionary Models Face Off (Covina, CA: Reasons to Believe, 2014), 203-5. 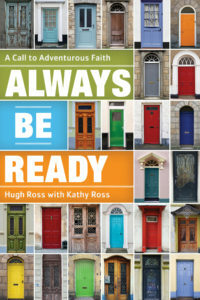 17 See Why the Universe Is the Way It Is by Hugh Ross. 18 See Beyond the Cosmos: The Transdimensionality of God by Hugh Ross. 19 See Who’s Afraid of the Multiverse by Jeffrey Zweerink. 20 McLean, Max. 2017. “Deus Ex Machina.” Fellowship Circle, Fall 2017. *Page numbers not available in Kindle version. Posted in Origin of Life. As soon the Earth’s molten mass cooled following the Hadean Era, moon-forming event, and late heavy bombardment, life was present and proliferating in all of its diverse and mysterious glory.1 The oldest rocks are 3.9 billion years old (bya) and radiometric bio-signatures date to earlier than 3.8 bya.2,3 Because life appeared so rapidly and under such hostile conditions, some origin-of-life (OOL) researchers believe that Earth-life may have originated elsewhere and then arrived via meteorite during the fray.4 Perhaps life even initiated independently both on Earth and on other planets or moons. Alternatively, the planet’s earliest life-forms may have lurked in deep places, easily riding out catastrophic conditions raging above on the surface. In order to posit novel naturalistic OOL scenarios, scientists look to some exotic little microbes harbored within some of the world’s most extreme environments. Extremophiles demonstrate that life can exist in a wide variety of conditions: high temperatures, low temperatures, high pH, low pH, high salinity, or high pressure.5 Life can be found nearly everywhere, so first-life must have been fast and easy, even simple – so it would seem. Because they exhibit some of the smallest genomes of independently living, non-symbiont, non-parasitic organisms, various extremophilic organisms appear to be rooted at the base of the of the evolutionary tree.6,7 Maybe OOL researchers have simply not been looking in the right places. Even so, finding life in any locale is not the same as finding its origin. Thermophiles and hyperthermophiles are early-life candidates that presumably developed as the mostly molten Earth started to cool. They can withstand temperatures up to 70°C and 113°C, respectively, and may also occur in the high-pressure environments near hydrothermal vents. Research has shown that deep ocean chemistry can produce peptides, amino acids, and other bio-precursor molecules.8 In general, however, most prebiotic molecules are unstable in extreme conditions. OOL-critical RNA has been found to be particularly delicate.9 In addition, the cycling of the ocean through these superheated, underwater vents is physically destructive.10 Though some OOL chemistry might be favored at these sites, it is unlikely that all the necessary reagents would remain viable throughout the necessary sequence of OOL reactions. Even though life is still inadequately characterized and ill-defined, it still seems to be an “all or nothing” proposition for the most part. It is also important to note that thermophilic biochemistry is not “simple.” Rather, “heat-loving” proteins are customized for the stability in hot environments, and they do not adapt well to mesophilic environments. Special interactions between the proteins’ amino acids stabilize their three-dimensional structure, but these same interactions result in a maladaptive rigidity in mesophilic conditions.11 Furthermore, experimentation seems to indicate that the rRNA of the presumed LUCA would have possessed insufficient guanine and cytosine content to have been a thermophile.12 Stanford University and NASA Ames Research Center have determined that as early Earth cooled, “temperature[s] would have persisted within a thermophilic window for at least 100,000 years but for no more than 10 million years – a time window far shorter for life than that on which natural process life-origin models depend.”13 Just as a gradual formation of thermophilic life-form is difficult to imagine, its transformation into a mesophile seems equally unlikely. It appears that they were created in-place, fully customized from the start, with a low likelihood of relocation to mesophilic conditions. 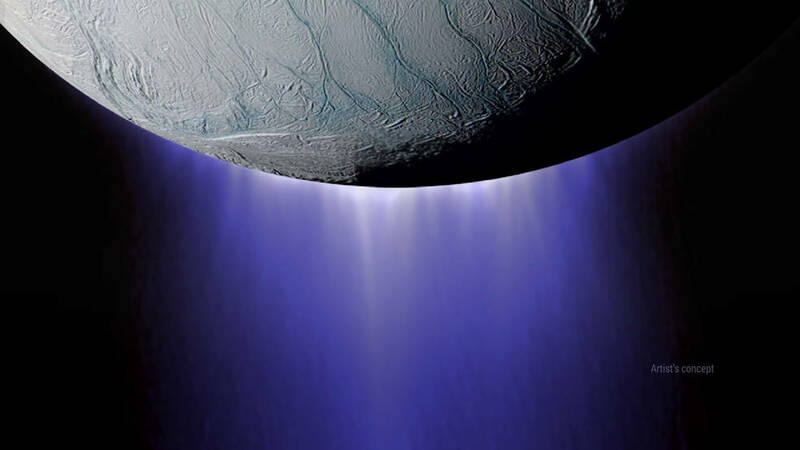 As thermophiles potentially expand the OOL timeline, psychrophiles theoretically expand the OOL habitable zones out to the icy moons of Saturn and Jupiter.14 Such microbes have been found living comfortably in the Antarctic Ocean at around 4°C.15 Bada and Lazcano have noted that low temperatures stabilize some biomolecules, and that some putatively necessary prebiotic reactions only occur in the laboratory at temperatures near 0°C.16 Since the bio-necessity of liquid water remains, psychophiles find ways to lower the freezing point of water. They utilize concentrations of certain molecules17 or antifreeze proteins to this end. This means that these special accommodations would need to be present during the naturalistic construction of the first psychophile in addition to all the “standard” OOL reactants and chemistry. Otherwise, as water began to freeze, cold denaturation would have arrested the hydrophobic effect that allows membrane aggregation, protein folding, and formation of RNA and DNA replicator molecules.18 We find that the whole organism is more robust that its constituent parts, which makes a purposeless and gradual, step-by-step construction process seem implausible. Sub-surface life found as far as 3.7 miles deep in the Earth’s crust and has prompted even more OOL speculation. Scientists believe that a deep-biosphere may offer realistic early-Earth conditions for first-life or alternatively provide insight into how OOL scenarios transpired beneath the surfaces of other planets and moons.19 Underground or underwater ecosystems in regions devoid of sunlight are often found to depend on organics trickling down from photosynthetically derived products closer to the surface.20 A few microbial populations are truly isolated from surface organics, however, and can live off of crustal carbon dioxide and hydrogen gas generated as water interfaces with rock at tectonic plate boundaries. This, however, is a rare and finely tuned phenomenon that could not occur where tectonic activity is not present (e.g., Mars). In addition, the deeply localized organics have been biogenically produced by these organisms, leaving the origin of their initial organic precursors a mystery.21 Paul Davies asserts that LUCA likely “lived deep beneath the Earth’s surface, at a temperature well above a hundred degrees Celsius, and probably ate sulfur,” but he also concedes that “it is clear that this little creature was already a sophisticated life form with complex features like coded protein synthesis.”22 Furthermore, deep-Earth organisms typically possess extremely low metabolic rates,23 rendering them incapable of sufficiently rapid replication rates required to promote the fast-paced evolutionary advances required by naturalistic models. Although the search for a mechanistically initiated origin of life continues, extremophiles seem to have originated in-place, optimized and operational from the start. 1 Fazale Rana and Hugh Ross, Origins of Life: Biblical and Evolutionary Models Face Off (Covina, CA: Reasons to Believe, 2014), 175-6. 3 Takayuki Tashiro et al., “Early trace of life from 3.95 Ga sedimentary rocks in Labrador, Canada,” Nature 549 (2017): 516-8, http://www.nature.com/nature/journal/v549/n7673/full/nature24019.html. 4 Paul Davies, The Fifth Miracle: The Search of the Origin and Meaning of Life (New York: Simon & Schuster Paperbacks, 2000), 186. 5 Fazale Rana and Hugh Ross, Origins of Life: Biblical and Evolutionary Models Face Off (Covina, CA: Reasons to Believe, 2014), 177. 7 Rana, Fazale. “Lesson 9: Assembly Of Life, Part 2.” Lecture Notes, Advanced Origin of Life Seminar, Reasons Institute, 2006 (revised 2017). 8 Fazale Rana and Hugh Ross, Origins of Life: Biblical and Evolutionary Models Face Off (Covina, CA: Reasons to Believe, 2014), 178. 22 Paul Davies, The Fifth Miracle: The Search of the Origin and Meaning of Life (New York: Simon & Schuster Paperbacks, 2000), 186. 23 Fazale Rana and Hugh Ross, Origins of Life: Biblical and Evolutionary Models Face Off (Covina, CA: Reasons to Believe, 2014), 184. Origin of life research is generally conducted in two different, but related, ways: “bottom-up” and “top-down.” “Bottom-up” researchers seek a combination of chemical reactions that could have yielded a simple, first life-form on the early Earth. “Top-down” researchers seek to understand the simplest of contemporary life-forms, primarily by ascertaining their minimum genome requirements.1 Pathways forged by “bottom-up” and “top-down” camps theoretically meet somewhere in the middle to catch a glimpse of the first-life’s mysterious appearance as well as its transition into the no-less-elusive last universal common ancestor (LUCA). Both routes must reckon with the empirically determined essentials of life: energy production and metabolism (including catalysts and/or enzymes), information-bearing replicating molecules (including translation mechanisms), and a cell barrier to partition off life from non-life (yet allow interaction with the external environment). Befuddled by simplest life’s innate complexity, both camps would desire to simplify their labors by jettisoning any nice-but-unnecessary, auxiliary cellular functions in order to find a “basic” unit of life that is relatively simple. Bottom-up researchers are continually plagued with the finding the appropriate prebiotics in realistic concentrations and determining the mechanisms by which they could all come together to successfully produce living cells given the conditions of the early Earth. First, they possess an inadequate knowledge of such conditions, and what they do know seems to mitigate against life. To make matters worse, each hypothetical (and often convoluted) chemical pathway thought to produce a single nascent necessity seems to work against other pathways that lead to products no less important. Yet, all the parts seem to have arrived simultaneously to work in concert rather quickly – a little too quickly. Finally, there is the perpetual problem of the experimenters themselves, who continuously inject their own intelligent influence to purportedly produce a naturalistic outcome. Bottom-up researchers are therefore caught in a maddening loop that still yet lacks life. If top-downers could successfully synthesize a living cell “from scratch” (simple, inorganic compounds) as they are instructed in the lessons of life by today’s simplest organisms, this would provide a much-desired proof-of-principle for the bottom-up researchers; it would show that life can be constructed from chemicals. For now, however, these researchers can fundamentally change the characteristics of existing cells, but they must rely heavily on existing organics and bioinformation. Quite remarkably, Craig Venter’s team at Synthetic Genomics, Inc., has apparently transformed Mycoplasma capricolum into Mycoplasma mycoides by implanting a synthetic genome of the former into the latter. 4 They cannot yet initiate life, though they soon might. Even so, though the nature of the physical world may be further elucidated, the necessity of intelligent agency will be simultaneously affirmed. Scientists may manipulate existing matter and information systems in ways that produce physical life demanding at least hundreds of genes,5 but this is a minimum complexity that is still uncomfortably complex from a naturalistic, bottom-up perspective. Yet according to Scripture, various forms of life are more than merely physical and may also manifest that which is soulish and spiritual.6 When scientists look beyond where empiricism can probe, they may find more meaning in the mysteries than the mechanisms. 6 Fazale Rana and Hugh Ross, Origins of Life: Biblical and Evolutionary Models Face Off (Covina, CA: Reasons to Believe, 2014), 79. *Page numbers not available in Kindle edition. This commentary is based on an interview conducted by Reasons to Believe (RTB) with origin-of-life researcher Robert Shapiro. It was recorded on an unknown date prior to his Dr. Shapiro’s death in 2011. Shapiro is able to step back from the detailed chemistry that confounds most and view the big OOL picture. He then authoritatively states what the layperson had hoped was obvious: organic molecules are not alive, irrespective of their abundance and diversity. Moreover, more time does not solve the problem. Life requires more than just chemical reactions; it requires complex organization. We simply do not comprehend its origin. Shapiro dislikes the use of the term “prebiotics” when applied to meteor composition due to the unfounded assumption that such chemicals would become “biotic” under some yet-to-be-determined circumstances. Rather, he believes that the “massive molecules” that characterize biological systems on the contemporary Earth run counter to what chemists currently know and can explain. He points out that the very scientists who claim to recreate the first unguided steps toward life on early Earth are actually conducting carefully controlled experiments, magnificent in terms of their design by intelligent agency. After all, organizing complexity is not what we typically find in chemical milieus governed by second law of thermodynamics. Is it reasonable to believe that, once upon a time, some highly significant, albeit unguided, reactions somehow capitalized on localized releases of energy to self-organize and advance in their complexity when no experiments have been conducted to support this notion? It is beneficial, as well as somewhat refreshing, that all critiques are not being made by creationists. Internal disagreements between replicator-first and metabolism-first OOL camps provide insight into the shortcomings of each. Few secular researchers are willing to openly acknowledge the flaws of both positions and suggest taking an entirely different approach. Shapiro is critical of bottom-up research of chemical mechanisms carried out in pristine laboratory settings as guided by ingenious investigators. He is also critical of top-down paradigms. Whereas biologists see the uniformity of materials that compose living organisms as our greatest clue towards a viable OOL solution, Shapiro considers the continuity of life’s structure as something that may be misleading scientists, diverting their attention from the exotic reactions that might be found to spawn life. Though Shapiro rightly points out the proactive role of the investigator in OOL research, he by no means accepts intelligent design as a tenable explanation for the origin of the universe or life. He politely, but rigidly, insists upon both philosophical and methodological naturalism, and he fully anticipates that naturalistic answers will be found through ongoing research. This provides the opportunity for Hugh Ross, PhD, to explain the importance of the RTB creation model that offers testable, scientific predictions based on various worldviews in order to see which one yields the best empirical results as more and more scientific data becomes available. When confronted with the possibility of the supernatural, Shapiro respectfully relegates anything beyond human senses and empirical proof as being something other than the science and the subject at hand. He stalwartly insists upon keeping the domains of science and philosophy separated into non-overlapping magisteria (NOMA), yet he is not immune to a desire for something more. It is with some vulnerability that he states, “Well, to me, our very existence is a wonder…a wonder, a surprise, something that’s awesome.” Perhaps his affection for “a [fictitious] place called Xanth where every human being had some magical property” is a trace of the unrealized capacity for eternity burning within. Why would materialism lead to the conclusion that anything (much less everything) can be known? That which is bound by time and space cannot reach up to transcendence but rather transcendence must reach down to bestow not only knowledge but the very capacity for it. In a way, NOMA assumes that the philosophical realm does not align with the natural world – a dichotomy which is consistent with the naturalistic worldview, as alluded to by philosopher Kenneth Samples. Even so, the naturalist uses the same human brain to carry out the philosophical reasoning and logic as he does to conduct and accept science. During the interview, Shapiro acknowledges that no one knows why there is something rather than nothing but then stops short. Perhaps the mystery of life is meant to lead us beyond the boundaries of empirical investigation – not to life’s origin but rather to its Source. Make your own tracks…Another synthetic chemist, James Tour, PhD, addresses his colleagues regarding the search for life’s origin: http://inference-review.com/article/an-open-letter-to-my-colleagues. The advent of Big Bang cosmology narrowed the history of universe to 13.8 billion years. From a naturalistic perspective, both chemical evolution and biological evolution must fit within this timeframe. (The production of extraterrestrial prebiotic and organic molecules would not be constrained to Earth’s formation 4.5 billion years ago [bya].) As plausible dates for the last universal common ancestor (LUCA) recede further and further into the past, less time is available for complex chemistry to birth first-life. Fossil and geochemical data indicate that earliest life dates back to 3.7 bya, perhaps to 3.8+ bya.1 For example, rocks in Australia and South Africa dated at 3.3 and 3.5 bya bear the signs of fossilized prokaryotes. The carbon-12 enrichment of the samples implies past photosynthetic activity.2 Researchers do not question the early appearance of life but rather “the rapid emergence of cyanobacteria and complex photosynthetic processes.”3 pushing dates for a more chemically simplistic LUCA back even further. Chemical evolution and biological evolution therefore must vie against one another for the available cosmic time. “Traditionally, origin-of-life researchers have posited that chemical evolution took place over hundreds of millions, if not billions, of years. More recent assessments allow only about ten million years for life’s origin to take place.”9 Given the available timeframe, scientists like Antonio Lazcano and Stanley Miller must simply retrofit their time estimates for the evolution of cyanobacteria to suit.10 Furthermore, all OOL scenarios require the development of delicate RNA molecules that must be soon incorporated into living systems or degrade quickly11 – an independent indicator that life must develop rapidly. Meanwhile, no viable mechanisms have been determined to potentially produce life on early Earth – slowly or rapidly. 1 Fazale Rana and Hugh Ross, Origins of Life: Biblical and Evolutionary Models Face Off (Covina, CA: Reasons to Believe, 2014), 75. 6 Takayuki Tashiro et al., “Early trace of life from 3.95 Ga sedimentary rocks in Labrador, Canada,” Nature 549 (2017): 516-8, http://www.nature.com/nature/journal/v549/n7673/full/nature24019.html. 7 Fazale Rana and Hugh Ross, Origins of Life: Biblical and Evolutionary Models Face Off (Covina, CA: Reasons to Believe, 2014), 91. 8 Fazale Rana, Lecture #10: “Early Earth’s Environment,” Reasons Institute “Origin of Life” online course, 2017. 10 Fazale Rana and Hugh Ross, Origins of Life: Biblical and Evolutionary Models Face Off (Covina, CA: Reasons to Believe, 2014), 87, 90. Life-essential elements, prebiotic compounds, and even organic molecules, occur in interstellar space,4,5 comets,6 meteorites,7 asteroids, planets, and moons.8 Schwartz and Chang thereby assert that “organic matter occurs throughout the Universe as an integral component of cosmic evolution…[T]he prospect of identifying other life-harboring solar systems seems inevitable.”9 OOL researchers must yet determine how closely the prevalence of life directly corresponds to the proper abundances of necessary reagents, catalysts, and energies. More specifically, Earth’s history and formation as part of the larger solar system must be considered in order to assess the plausibility of proposed OOL scenarios. The presence of interstellar organics might be thought to seed and speed Earth’s chemical evolution process; however, a steady pummeling of high-energy impactors during the Hadean Era, Moon-forming event, and late heavy bombardment (LBH) would have likely destroyed complex molecules, vaporized surface water, and significantly altered atmospheric conditions. At this point, it should be noted that an inadequately founded assumption regarding the composition of the early atmosphere reduced (pun intended) the Miller-Urey proof-of-principle experiment from a milestone to a mile marker on the road to first-life. But during the OOL’s “greatest frustration event,” the LBH, impact collisions produced a hot, molten surface that would deter the formation of a permanent land and ocean features until about 3.85 billion years ago.10,11 Fossil and geochemical data indicate that earliest life dates back to 3.7 billion years ago (bya), perhaps to 3.8+ bya.12 The plausible window of opportunity for elaborate chemical pathways to produce Earth’s first life closes, nearly shut. “Origin-of-life researchers [now] recognize that life had no more than tens of millions of years to emerge”13 – a far different scenario that what could have ever been imagined by earlier scientists who accepted a steady-state model of the universe. A rapidly increasing understanding of how cosmological events impacted (pun intended) the early Earth is reshaping OOL models. Those seeking purely naturalistic scenarios find that life is hard and its origin frustrated. 1 William J. Schopf, ed., Life’s Origin: The Beginnings of Biological Evolution (Berkeley, CA: University of California Press, 2002), 33. 10 Fazale Rana and Hugh Ross, Origins of Life: Biblical and Evolutionary Models Face Off (Covina, CA: Reasons to Believe, 2014), 63. The proposed RNA World is a linchpin concept in origin-of-life (OOL) research. RNA seems to conveniently solve the chicken-or-egg dilemma faced by scientists who observe double-stranded DNA coding for the very same protein-based enzymes responsible for its own replication, transcription, and translation processes. In contrast, single-stranded RNA seems to multi-task well, both replicating and providing enzymatic functions. Furthermore, different RNAs mediate critical steps in the process of protein synthesis from DNA; their pivotal intermediary roles assumed to be embedded traces of a past RNA World. Yet the RNA World does not fare well in bottom-up chemical evolution models, especially when carefully managed proof-of-principle experiments in pristine laboratory conditions are compared to the environmental conditions likely present on the early Earth. Given the seemingly intractable problems of the RNA World, as well as dissatisfaction with metabolism-first OOL scenarios, researchers now look back further to a Pre-RNA World to set the stage. Achiral peptide nucleic acid (PNA)10 or threose nucleic acid (TNA) alternatives appear to solve some problems but concurrently add layers of complexity to an already daunting challenge. 1 Paul Davies, The Fifth Miracle: The Search of the Origin and Meaning of Life (New York: Simon & Schuster Paperbacks, 2000), 134. 2 Fazale Rana and Hugh Ross, Origins of Life: Biblical and Evolutionary Models Face Off (Covina, CA: Reasons to Believe, 2014), 114. 8 Fazale Rana and Hugh Ross, Origins of Life: Biblical and Evolutionary Models Face Off (Covina, CA: Reasons to Believe, 2014), 121. 11 Leslie E. Orgel, “Prebiotic Chemistry and the Origin of the RNA World,” Critical Reviews in Biochemistry and Molecular Biology 39 (March-April 2004): 99-123.
Who Moved My Primordial Soup? I have not even mentioned the origin of biological information or the homochirality of biomolecules yet.20 Simply put, for those seeking naturalistic OOL solutions, life is hard. 3 Paul Davies, The Fifth Miracle: The Search of the Origin and Meaning of Life (New York: Simon & Schuster Paperbacks, 2000), 91. 6 Fazale Rana and Hugh Ross, Origins of Life: Biblical and Evolutionary Models Face Off (Covina, CA: Reasons to Believe, 2014), 104. 8 Fazale Rana and Hugh Ross, Origins of Life: Biblical and Evolutionary Models Face Off (Covina, CA: Reasons to Believe, 2014), 103. 11 Fazale Rana and Hugh Ross, Origins of Life: Biblical and Evolutionary Models Face Off (Covina, CA: Reasons to Believe, 2014), 105. 12 William J. Schopf, ed., Life’s Origin: The Beginnings of Biological Evolution (Berkeley, CA: University of California Press, 2002), 101-2. 13 Fazale Rana and Hugh Ross, Origins of Life: Biblical and Evolutionary Models Face Off (Covina, CA: Reasons to Believe, 2014), 90-91. 14 Paul Davies, The Fifth Miracle: The Search of the Origin and Meaning of Life (New York: Simon & Schuster Paperbacks, 2000), 62. 15 Fazale Rana and Hugh Ross, Origins of Life: Biblical and Evolutionary Models Face Off (Covina, CA: Reasons to Believe, 2014), 103-4. 16 William J. Schopf, ed., Life’s Origin: The Beginnings of Biological Evolution (Berkeley, CA: University of California Press, 2002), 107-8. 17 Fazale Rana and Hugh Ross, Origins of Life: Biblical and Evolutionary Models Face Off (Covina, CA: Reasons to Believe, 2014), 95-6. 18 Fazale Rana, Lecture #12: “The Fossil Evidence,” Reasons Institute “Origin of Life” online course, 2017. 19 Paul Davies, The Fifth Miracle: The Search of the Origin and Meaning of Life (New York: Simon & Schuster Paperbacks, 2000), 91. 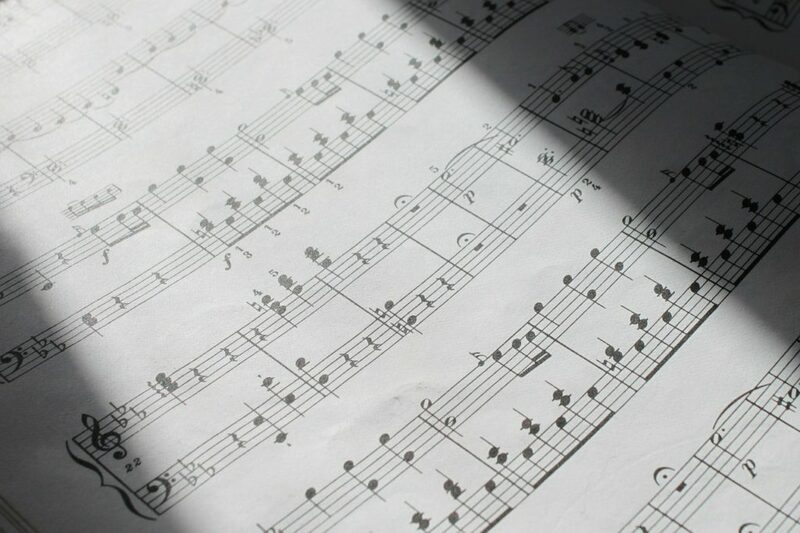 Is life’s song a transcendent composition or a collection of notes arranged in perceptible patterns? Characteristics common to contemporary life have accumulated, yet “life” is still not sufficiently characterized.1 Notwithstanding the lack of an adequate definition, life is universally acknowledged as being complex. Evolutionists assert a continuum of complexity bridging chemicals to creatures, but the minimum requirements for the simplest possible synthetic life-form are yet to be ascertained.2 What has been assumed to be “simple”3 may not have been so simple. Does Earth’s life reflect levels of increasing complexity or layers of irreducible complexity? Is life so complex that it must indeed be rare, or is it necessarily abundant throughout the universe?4,5 Is physical life (i.e., bacteria and plants) merely a “continual throughput of matter and energy,”6 distinguished from the inanimate only in death? If, according to Paul Davies, “[t]he living cell is crammed with miniature machines,”7 does death simply flip the switches to “off”? The question becomes even more complicated when considering soulish nephesh creatures or spiritual humans. Apart from the philosophical or religious implications, origin-of-life researchers have their own set of concerns regarding the definition of life. Since science deals only with physical matter and processes, it is inherently reductionistic. Dr. Fazale Rana observes that “[u]nderstanding the operation of a system is not the same as explaining where it came from.”8 Unless life is reliably defined, how will researchers know when they have successfully found it or its origin?9 As they contemplate the possibility of chemical evolution on the early Earth, how fuzzy or distinct is the line that divides macromolecules and chemical reactions from independently functioning and replicating microbes? Is there anything actually primeval and vestigial lying within contemporary cells,10 or do such assertions by evolutionists simply beg the question? When they look beyond Earth, how might scientists identify life’s precursors or extraterrestrial life-forms fundamentally novel in structure and function? Are hopes to indefinitely extend human life grounded in solid science or is the dream of transhumanism merely a cruel distraction from a Creator who can truly bestow Life? Even so, definitions still matter in the here and now. Validation of artificial, synthetic, or novel life in the laboratory will depend on the precision of life’s definition.”11 Scientists sometimes describe life’s complexity as being instructed, specified, contextualized, and organized, but will a positive case for intentional complexity be made? Intentionality implies a Mind and Volition. Has a such a Being likewise endowed us with some level of free will? Davies observes that animals (even bacteria) seem to contain “some inner spark that gives them autonomy, so that they can (within limits) do as they please.”12 Making use of our free will, to Whom will we credit our existence? 3 Fazale Rana and Hugh Ross, Origins of Life: Biblical and Evolutionary Models Face Off (Covina, CA: Reasons to Believe, 2014), 60. 6 Paul Davies, The Fifth Miracle: The Search of the Origin and Meaning of Life (New York: Simon & Schuster Paperbacks, 2000), 37. 10 Paul Davies, The Fifth Miracle: The Search of the Origin and Meaning of Life (New York: Simon & Schuster Paperbacks, 2000), 34, 49-50. 12 Paul Davies, The Fifth Miracle: The Search of the Origin and Meaning of Life (New York: Simon & Schuster Paperbacks, 2000), 36. *Kindle version did not include page numbers. 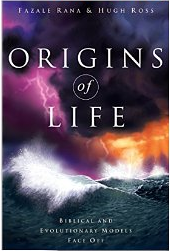 In Chapter 1 of Schopf’s “Life’s Origin,” Oró interacts with the worldview implications of a secular and cosmic OOL. He offers a utopian prescription for “children on the Universe” to coexist peacefully on Earth: treat[ing] others as we would like them to treat us.”3 However, his naturalistic worldview provides no solution or redress when its pivotal Golden Rule (borrowed from Christianity) is not observed. Why peace rather than war when nature is “red in tooth and claw” and “survival of the fittest” has brought you thus far? Unfortunately, the material universe is a vast and uncaring parent, and to be its child is to be bereft of ultimate meaning and significance. Children of a Creator, however, possess an eternal identity and purpose. To be created intentionally and loved sacrificially confers a knowledge of one’s value. But what humans expend great cost and energy to create a mechanistic form of life – a self-replicating machine, programmed by scientists and composed of organic compounds fashioned from existing matter? It might happen in the not-so-distant future.4 Yet are we so boundless in our character and capabilities that we might endow any future version of it with “inalienable rights”? Might we grant access to other dimensions to which we have no passage or enact transcendent moral law over which we have no governance? Human endeavors to create life should not be unanticipated; we are creative because we are made in the image of our Creator. Nevertheless, even the successful development of synthetic life certainly would not be evidence of an unplanned advancement of molecular transitions on the early Earth. Rather, it would be a brilliantly contrived and highly controlled endeavor indicative of intelligent agency. Hebrews 2:3-4 tells us that “…the builder of the house has more honor than the house itself. For every house is built by someone, but the builder of all things is God.” Perhaps we will find that what is true of “houses” will be also be true of man-made organisms. As elegant as a synthetic cell might be, the sophistication of its human designer will far exceed it. Then, in turn, the grandeur of God is still greater. He is the Builder of all things, providing both the minds and materials for every innovative endeavor. 1 William J. Schopf, ed., Life’s Origin: The Beginnings of Biological Evolution (Berkeley, CA: University of California Press, 2002), 3. 2 Fazale Rana and Hugh Ross, Origins of Life (Covina, CA: Reasons to Believe Press, 2014), 26-7. 3 William J. Schopf, ed., Life’s Origin: The Beginnings of Biological Evolution (Berkeley, CA: University of California Press, 2002), 40-1. 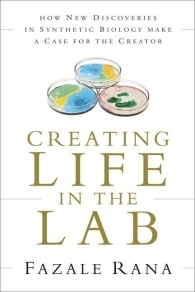 4 Fazale Rana, Creating Life in the Lab (Grand Rapids: Baker, 2011), 20. Posted in Origin of Life, Science for the Everyday Christian. Visit Science: God Speaks Through the World to find regularly updated resources that integrate science and theology. Select Scripture: God Speaks to the World for articles and videos about the historicity and reliability of Holy Scripture. 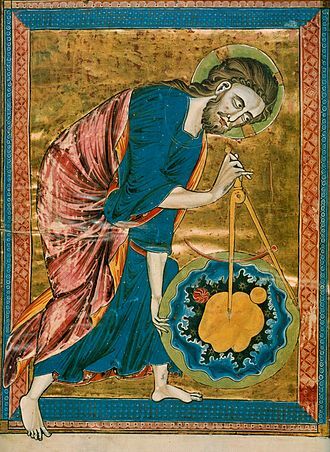 Codex Vindobonensis 2554 (French, ca. 1250), in the Österreichische Nationalbibliothek. Posted in Science for the Everyday Christian. Supernova explosions are among the most dramatic events witnessed in the night skies. In the throes of death, a massive and expanding star suddenly collapses. Gravity forcefully slams the star’s celestial substance into its stellar core to produce a high-energy shock wave and grand, explosive finale. A brilliant light suddenly appears in the sky, rendering our usual assortment of evening stars dim in contrast. A once giant star goes out, quite literally, with a bang. Its starlight will only linger a few months but its stardust will be distributed over great distances in the vastness of space, interacting with worlds far away for unknowable eons of time. 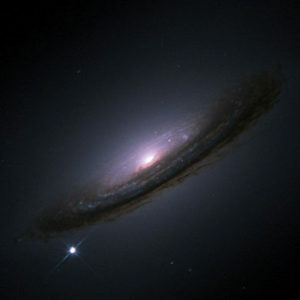 When visible from Earth, a supernova arrests the attention of those who realize its significance. Even those supernovae that go unrecognized, however, distribute various heavy metals to other planets. Most of Earth’s inhabitants do not realize that nearly the full complement of naturally occurring elements found in our periodic table were deposited here by multiple supernovae, each occurring at a particular time and place in relationship to our developing planet. The ashes of once giant stars provide the atomic building blocks for the life we experience and the advanced technologies we employ. In Scripture, we find a similar phenomenon. Sometimes a person transitions from being merely massive in their impact on the world around them to shining as a ultra-bright light with eternal influence. Samson is an example. He was renowned for the great military feats of his youth, but he also suffered greatly as he bore the consequences of sin. Yet he did not bear these consequences forever. He still had time to “go supernova.” He will ever be remembered for his final strategic attack on the Philistines (Judges 16: 28-30), and he is recorded among those who are known for their lives of faith (Hebrews 11:32). In the New Testament we find other characters with different stories but similar stellar testimonies of faith in their final days and moments. Paul, for example, was the quintessential Pharisee, keeping every letter of the Law, minding every jot and tittle — yet struggling against the One he claimed to serve (Acts 9:1-19). He was a big star in his little world but yet to actually ignite. Eventually Paul was to be consumed by a ministry that would explosively shine the light of the Gospel beyond the world he knew and divinely distribute the inspired letters he penned throughout the Earth for millennia to follow. Stephen, on the other hand, seemed to have lived a respectable and admirable life all along. The early church made him a deacon, but God made him a supernova light in the darkness around him. His face glowed with a transcendent radiance as he testified (before an unconverted Paul, still known as Saul) in his final, mortal moments (Acts 6:8-7:60). A larger-than-life character collapsed, reduced to ink on paper, but even now his story bursts forth from the pages of Scripture into the awareness of its readers for all time. Throughout the Bible, many other “stars” have shone brightly for a brief time then quietly distributed their life-essential messages to far away places. They permeate not only space but also time for their words disseminate spiritual elements that edify the faith of those who come after them. Even a guilty and dying thief made his way into the Holy Scriptures as he confessed the deity of Christ from a cross (Luke 23:32-43). Regardless of what our lives have yielded to this point and irrespective of the wrongs we have committed, let us pray to go supernova in the end — demonstrating God’s brilliant glory to a watching world even with our final breath. Learn more about your world and others in “Why the Universe Is the Way It Is” by Hugh Ross. “Starkindler” by Michael Card provides the perfect soundtrack as you start your exploration. Copyright © 2016. 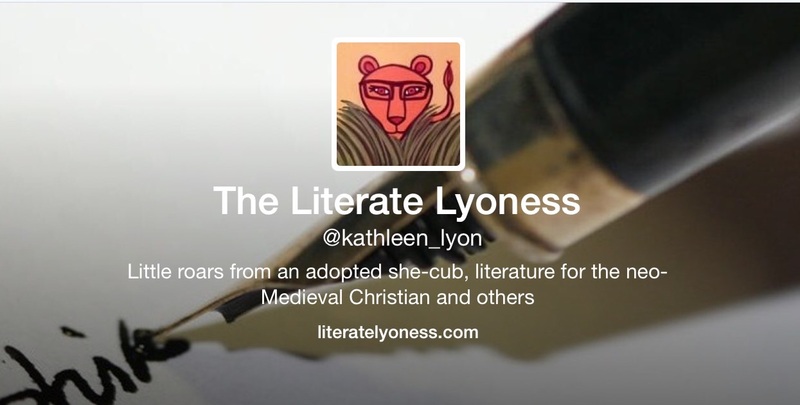 The Literate Lyoness. All rights reserved. 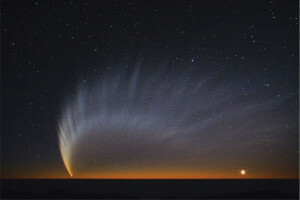 Composed of icy cold dust and gas, comets are sometimes called the “dirty snowballs” of space. More recently, they have been characterized as “icy dirtballs.” Irrespective of monikers, one will occasionally streak into our solar system within view of Earth’s observers, and the show begins. As the comet bears in, the Sun heats its surface and a plume of jettisoned matter spews forth, glowing in the light that has unbound it and leaving a long trail of debris behind. A comet’s head may shine brighter in the sky than planets and stars, and its tail may stretch out for millions of miles behind. In Genesis 2:7 we read that “God formed the man of dust from the ground and breathed into his nostrils the breath of life.” Inorganic matter was enlivened to make a man; dust of the earth was infused with an essence from beyond it. Was this man, Adam, a “dusty spirit” or “spiritual dust”? Divinity had interfaced with dirt, and an image of the Trinity had transferred to a creature bearing body, soul, and spirit. But to be the only creature taking on such grand characteristics of the transcendent Creator must have been too heady a proposition. Mankind found it difficult to believe that the full capacities of God were beyond his reach. Indeed, in a very mortal act of rebellion, something immortal died within. Now, rather than words of creation, words of judgment echoed in Adam’s ears: “By the sweat of your face you shall eat bread, till you return to the ground, for out of it you were taken; for you are dust, and to dust you shall return.” (Genesis 3:19). Sent beyond the boundaries of the bounty, dust was ever in sight before him as he trod from Eden with his head hung low. How Adam wanted once again to sense that sweet breath that had filled, not just his lungs, but his very being from the beginning! For though he still drew breath, a different kind of Life within him was no longer sustained. Surely without it, he was not fully alive. The dust particles that had coalesced now seemed disparate, lacking integration, insufficiently cohering. The gravitas of his identity now seemed to wane as if something ethereal had effused from him. Eternity was in his heart (Ecclesiastes 3:11), and it was that Life-giving breath that had given weight and substance to everything he had been or ever could have become. David knew well his substance and pleaded for mercy. But he pleaded as a son. A son of dust. *”O Worship the King.” Original lyrics by Ro­bert Grant, in Christ­ian Psalm­o­dy, by Ed­ward H. Bick­er­steth, 1833, alt. This ver­sion is a re­work­ing of lyr­ics by Wil­liam Kethe in the Ge­ne­van Psalt­er of 1561. Make your own tracks…“Light Up the Sky” by The Afters, as well as 2nd Chapter of Acts’ version of “Worship the King” in their Hymns Collection. Random Roars are now available at literatelyoness.com/random-roars or @kathleen_lyon on Twitter. 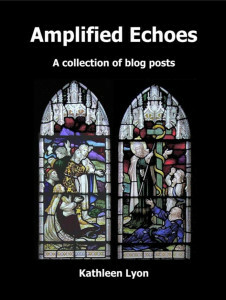 “Amplified Echoes” is now available in PDF format. This 60-page compilation of 2014 Literate Lyoness blog posts are formatted to be read in Adobe Acrobat Reader’s 2-page view. Enjoy! 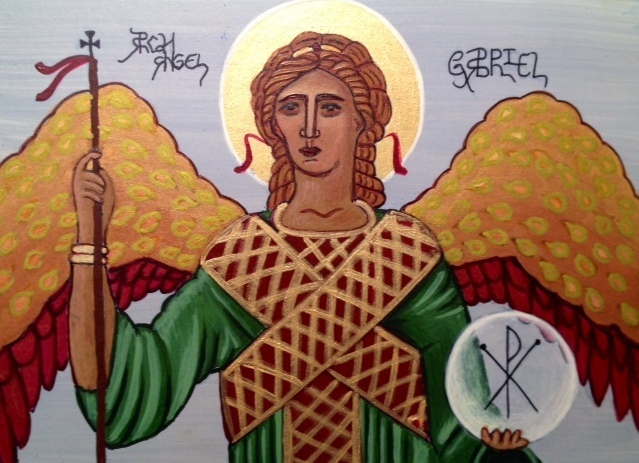 Possibly coming in 2015: “My Favorite Prophet Ezekiel.” Subscribe to this blog to get updates. In the meantime, you can contact me at thelyoness@literatelyoness.com. 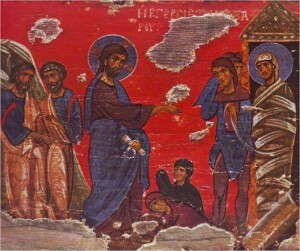 Christ Raising Lazarus, Athens, 12-13th century icon. From atop the Leaning Tower of Pisa, Galileo simultaneously dropped a massive canon ball alongside a much smaller musket ball. As they struck the the ground below with a single thud (more or less), a commonly held misconception was shattered. Shockingly, the erudite Aristotle had been erroneous in his assumption that two objects of different weights would drop at different rates. A simple demonstration to the contrary shook loose this faulty notion and plunged thinking minds forward into a new understanding of the natural world. In the field of science education, such occasions are called “discrepant events.” Simple observations that fly in the face of what we expect, thereby necessitating the development of new explanations to make sense of it all. Unnoticed weeds that have spread their roots through our minds are suddenly spotted and uprooted from our cognitive landscape — leaving a place for new ideas to grow. 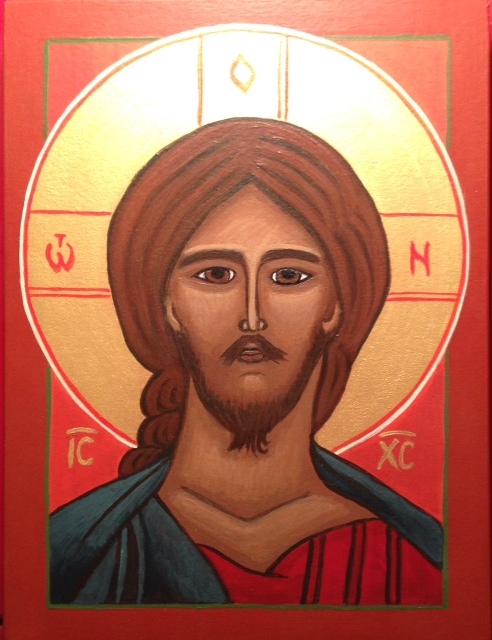 In the New Testament we find that Jesus was often addressed as “Teacher.” And that he was. Scripture records his skillful questioning techniques, powerful illustrations, instructive metaphors and, yes, perfectly timed discrepant events. Perhaps no story better displays Jesus’ pedagogical prowess in the use of this particular technique than the story of Lazarus in John 11. In this well known account, Jesus is notified that his beloved friend Lazarus is sick. Nevertheless, he waits for a couple of days before going to visit. When he finally arrives, Lazarus has died and Jesus is met by the grieving sisters, Mary and Martha. Each sister approaches Jesus with the same faulty “if, then” statement: “If you have been here, then our brother would not have died.” Their hypothesis revealed misconceptions that would need to be unlearned before relearning could take place. They knew Jesus had healed others who were complete strangers, so why now did he not rush to the aid of his close friends? Why had he lingered with the Twelve, speaking in puzzling metaphors? Jesus had tried to prepare his disciples in advance, but this lesson was going to be beyond words. It would need to permeate through them, beyond their minds and into their hearts and souls. And this discrepant event would not only generate cognitive dissonance, but emotional dissonance. The fabric of Mary and Martha’s thoughts and feelings would unravel into a mass of confused and disparate strands in order to be rewoven into a new garment of praise. (Isaiah 61:3) His precious friends would be devastated, though only temporarily. But Jesus was himself so embedded into their lives that he entered into their grief with them. Alongside them, he wept. Throughout the Gospels we find that Jesus met people where they they were before taking them where he knew they could be. For instance, the centurion already understood that time and space were not problematic for one with the authority and power to heal. (Matt. 8: 13) In that case, Jesus confirmed the man’s faith and moved on. But not in this case. Jesus didn’t answer questions directly and didn’t act immediately. Rather, he disoriented these folks enough that they started to reframe their questions. And this Instructor had skillfully used proofs before. At least a few of his skeptics had learned not to challenge him about his ability to forgive sin. (Matt. 9:1-8) Now he extended his claims further and provided a sufficient miracle to back it up. With this event, he would declare that he was the Resurrection and the Life. By bringing Lazarus back to temporal life, he would prepare his friends and followers to understand something of eternal life. Make your own tracks…Carefully examine Jesus’ instructional techniques as he speaks with both a rich, young man (Matt. 19:16-26) and a rich, old man (John 3:1-21) about how to obtain eternal life. Posted in Amplified Echoes, Science for the Everyday Christian. 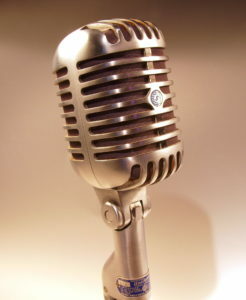 I plan to soon complete a post that will conclude a compilation titled “Amplified Echoes.” The title of the work reflects its intent: to speak again with clarity the words and ideas of ancient, holy scriptures — hopefully in ways that are fresh and compelling to contemporary readers. 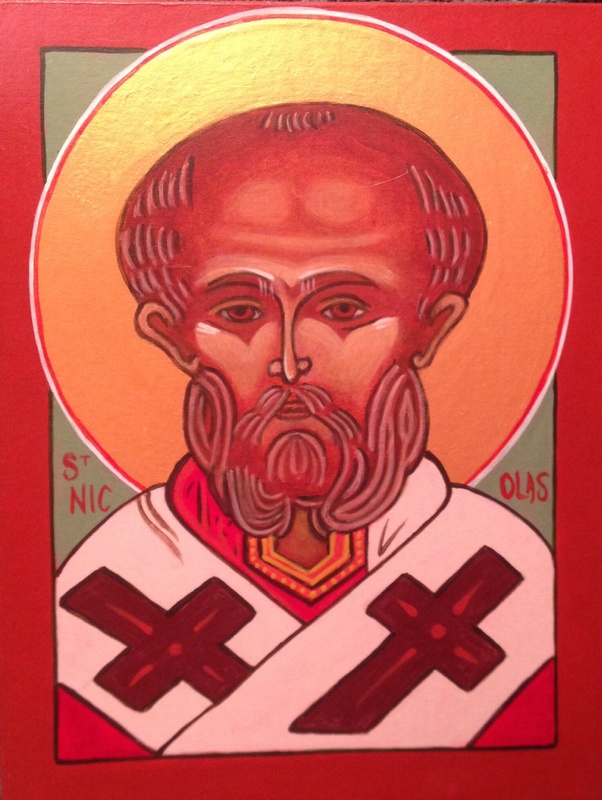 Featured icons, quotes, and lyrics are intended to evoke thankful reflection on the influence and work of saints around us, as well as those who have gone before. They now are part of the “great cloud of witnesses” that cheer us on to the end of our own race. (Hebrews 12:1-3) May the Author who penned Bible stories through his servants of old continue to tell new stories of his greatness through our lives as we seek to follow Christ today. let me be Your work of art! *From “Write Your Story,” on the album If We’re Honest. Written by Battistelli, Francesca; Garcia, David; Glover, Benjamin Michael. One of my favorite speakers and authors, Ravi Zacharias, often quotes Malcolm Muggeridge (1903-1990). Muggeridge was an English journalist as well as a soldier and spy during World War II. It was later in life that he began to write about Christianity and his personal faith. His fascinating life story is summarized on Wikipedia, but his own synopsis of the times is provided below. As we consider his words, may we also consider our own place in history. *Malcom Muggeridge, “But Not of Christ,” Seeing Through the Eye: Malcolm Muggeridge on Faith, ed. Cecil Kuhne (San Francisco: Ignatius Press, 2005), 29-30. Posted in Amplified Echoes, Random Roars. The roadways of the U.S. transportation system are a marvel of the modern, industrialized world. In a simple, pragmatic elegance, individuals daily execute complex patterns of motion to maintain their own particular life rhythms, operating their vehicles as part of a larger and interconnected symphony of mass motoring. To achieve this phenomenon, numerous factors have been carefully considered: mapping of routes, paving of roads, posting of signs and symbols, timing of traffic lights, manufacturing of vehicles to meet specifications, fueling of vehicles, allocation of parking, testing of drivers, lighting of thoroughfares, and the list goes on. And it all works beautifully…when it works. But when it doesn’t, an ordinary day can turn into a frustrating or even tragic day at a moment’s notice. For even in this most precisely planned of systems, there are variables. They are called drivers. Some drivers are largely ignorant of how the system is intended to work. Some drivers think the rules don’t really matter or just don’t apply to them. Others are distracted and oblivious to what is going on around them. Regardless of their state of mind, however, all these folks are wielding powerful machines and can easily become dangerous to themselves or others. And so it is with sin. 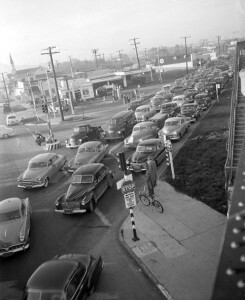 Sin creates traffic snarls in the patterns of our lives and those around us. God acts as a transcendent civil engineer to specify patterns that optimize movement. Not only with physical safety in mind, but with concern for our emotional and spiritual health as well. And his prescribed patterns for safe travel on life’s journeys are born out of holiness, a divine trait foreign to mere mortals. Much like Jude (v. 3-4), I wish that I could only discuss pleasant concepts and beautiful thoughts, yet the bitter topic of sin must be addressed to remain true to the goal of promoting biblical literacy. And to be true to harsher realities that we all experience. It must especially be addressed during this time of year. For there is no spring without winter. There is no Easter without Good Friday. Yep, I just had to bring up the “s” word. And as soon as a Christian does so, non-Christians immediately begin to cry “hypocrite.” And indeed, there are hypocrites. And even if we are not deserving of the label, we probably at least sporadically demonstrate the characteristic of hypocrisy. But an accurate view of sin and holiness does not naturally lead to this end. Rather, it leads to humility. Authentic Christ-followers know that they are not devoid of sin, but are being saved from it. (1 John 1:8) Faith and obedience then follow out of love and gratitude rather than an effort to achieve a state of sinlessness. *From lyrics at­trib­ut­ed to Ber­nard of Clair­vaux, 1153 (Sal­ve ca­put cru­en­ta­tum); trans­lat­ed from La­tin to Ger­man by Paul Ger­hardt, 1656 (O Haupt voll Blut und Wund­en), and from La­tin to Eng­lish James W. Al­ex­and­er, 1830. Make your own tracks…Arrangement of choice for this week is “O Sacred Head Now Wounded” on Beginnings by Fernando Ortega. Therefore, you kings, be wise; be warned, you rulers of the earth. Serve the Lord with fear and celebrate his rule with trembling. Kiss his Son, or he will be angry and your way will lead to your destruction, for his wrath can flare up in a moment. Blessed are all who take refuge in him. The presence or absence of light seems pretty simplistic. With no conscious effort, we flip light switches on and off 24/7, as needed. But light is anything but simple. In fact, the nature of light has baffled the most brilliant scientists for decades. The conundrum lies in that light exhibits two seemingly different natures simultaneously. For lack of a single term to characterize it, light is said to have “wave-particle duality.” This means that light sometimes appears to behave like a propagating energy wave (with no mass). But then change the experimental set up, and as if on a whim, light taunts the watching and waiting investigators of the natural world by acting like a particulate. Particles typically have mass, but light does not. This paradox is vexing and perplexing enough that it can’t just be ignored. Terms that once seemed quite basic…”matter,” “energy,” “particle,” “wave”…now must be continually redefined to try to make sense of it. It’s kind of a big deal because the properties of light are key to understanding the cosmos. Every equation relating to general relativity (that I can remember from college physics, anyway) includes the constant “c,” which represents “the speed of light.” Yet at the beginning of the 21st century, we still lack illumination regarding exactly what this radical radiation is like. Fascinating though…in the ancient book of Genesis, even before the Sun could be seen in Earth’s sky (vs. 14-18), light already defined universal boundaries yet to be discovered. And then, as I’ve mentioned before, there were creatures. And among them were sheep. Sheep do not know about the boundaries of the universe. It’s my understanding that they are not really that sure about how to find grass. This said, you may be insulted to learn that God often describes his followers as sheep. No one likes the idea of being helpless and dependent, even if they are. But when the frailty of the human condition becomes unavoidably apparent at a funeral, it is Psalm 23 that is commonly read to bring comfort. A psalm written from the perspective of a sheep, albeit a well-cared-for one. It is a well-known wellspring of words that flowed from the heart of God through David, a man who guided and protected the flock in his father’s pasture long before ruling the nation of Israel. Admittedly, however, sheep do have one innate capability: voice recognition. Though spread out over wide expanses and mixed together with other herds, they know how to gather when they hear the distinct call of their Good Shepherd. In fact, a sheep might tell you that vision is overrated, for most threats come by night. Better to stay within earshot of the One with the staff that nudges strays, but whacks predators. Lots of animals can see in the daylight, but no matter what the commotion, only ovine ears accurately identify the specific voice signature that matters. But beyond the typical sheep of the pasture, the Holy Scriptures are replete with references to the rather mysterious, other-worldly-sounding Lamb of God. The Lamb who opened not his mouth as he was led to the slaughter. Who died in submission to the will of the Father, though he had the authority to call upon legions of angels to rescue him. The Lamb who came to dwell among other sheep, but they knew him not. But this Lamb has yet another nature. You see, under the right conditions, he is quickly recognized as a Lion. Lambs may willingly submit to injustices, but lions take charge and call the shots. And this Lion sets things right, not with a wooden staff but with an iron scepter. (Psalm 2:9) You just can’t read the Bible for too long without coming to the conclusion that the Lamb of God who was slain is also the Lion of Judah who will reign. How can two contrasting natures impossibly coexist? Herein lies the quandary of both theologians and physicists. Examination of unfolding changes in the space-time continuum are likely to elucidate these matters for both in short order. And finally, just when you thought it was safe to listen to my music recommendations, take in some retro alternative rock tunes from AudioAdrenaline: “Mighty Good Leader” from Underdog, 1999. Posted in Amplified Echoes, Creatures. 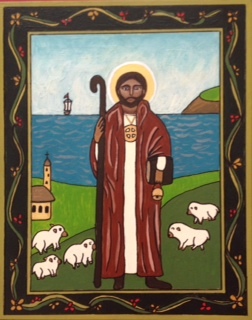 The original cartoon for this contemporary icon of Saint Patrick was designed by Leona Phelps. Leona just turned 100 years old in January of this year, and I’m grateful to her for instilling in me an interest in the ancient icons of the Church. Click the image to read about the life and ministry of Saint Patrick. There are many online resources that recount the perilous life of Saint Patrick and many versions of the Breastplate Prayer of Protection that bear his name. 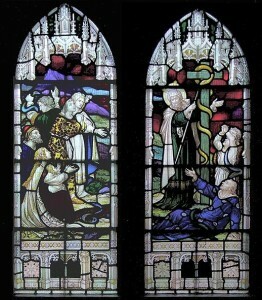 As he is the Patron Saint of Ireland, I thought it only proper to use this rendition from a Catholic site today. Furthermore, I would encourage you to pray for the protection of those in the armed forces and law enforcement services who daily defend the freedoms of both nations and individuals, at great risk to themselves. Leave your own tracks…For more modern protection praise, watch and listen to the very talented David Wesley perform “Whom Shall I Fear (The God of Angel Armies)” on YouTube. Like the Breastplate Prayer, the lyrics of this song capture the image of God’s protection on all sides. Related scripture readings: Psalm 91 would probably be a closer match to the Breastplate Prayer, but I’m leaning toward Psalm 17 today. Version of “Hospitality of Abraham” by Andrei Rublev. In Eastern Orthodoxy, the three angels represent the three “distinct and unconfused” persons of God that share a single eternal and divine essence. Click image for source info. “If God is for us, who can be against us?” (Romans 8:31b) That’s some tough talk from the Apostle Paul. So who exactly is this God he is talking about, and what is he supposed to be doing for me? We don’t even need to leave the chapter to find out. The Father has adopted us as beloved children and heirs. Keep in mind that if you are adopted, you were chosen. You were not taken in by chance or by accident. And for guilty sinners, it works out really well to be related to the Judge. Though he judges your misdeeds righteously, he has already arranged payment for all penalties you incur so that you can always stand legally justified. And he appoints Christ, the Lover of your Soul, to speak on your behalf when any accusations arise. (Romans 8:32-34) His arguments for you are so passionate and sweet that you are not only cleared of charges, but declared delightful as well. 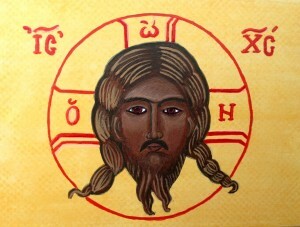 Father, Son, and Holy Spirit are all represented in this icon of the Baptism of Christ. Click here to learn more about the related Feast of Holy Theophany. Click image for source info. According to Merriam-Webster, a trifecta is “a bet in which the person betting forecasts the first three finishers in a race in the correct order.” Three bets in one. According to Saint Paul, you can put your money (as well as your fleeting life and eternal soul) down on these Three. They are a trustworthy wager. *Lyrics from “My Faith Looks Up to Thee” by Ray Palmer, 1830. Make your own tracks…Carefully review all of Romans 8 to learn how this Triune Tag Team seamlessly integrates its activities to make both temporal and eternal provisions for Their own. Nehushtan was the Hebrew name given to the bronze serpent held up by Moses to bring healing. Click the image for a better view. 14 Just as Moses lifted up the snake in the wilderness, so the Son of Man must be lifted up, 15 that everyone who believes may have eternal life in him. Thousands of years later, God himself donned the skin of sinful mankind and was raised on a cross, the remedy for the malady of falleness and depravity for those who would see it. The cross was the pivot point upon which the redemption of all the world turned. It now became evident that God had made a preemptive strike even before the foundation of the Earth. Though He had not created evil itself, He had created the potential for the inception of evil which stood before the world’s inhabitants in the form of a clearly visible tree with a clearly comprehensible commandment. For without at least one Law, there would have been no way to externalize what would fester within. And there could be no repentance without awareness of an infraction. (See Romans 5:12-21 for more detail.) Human beings would have then suffered the same eternal consequences of fallen angels with no recourse. So, don’t hold the whole Garden incident against the snakes in your backyard. God reclaimed and reframed this creature’s reputation by the fourth book of the Bible. At the same time, the Almighty not only crushed the true enemy’s head, but slapped him in the face as well. For ironically, Lucifer’s deceptive plot only served to advance God’s plan to enable men and women to become like Christ (1 John 3:2) — in a way, the very thing he falsely promised them in the beginning. How ’bout them apples? *Lyrics from “Rock of Ages” by Au­gus­tus M. Top­la­dy, 1776. Make your own tracks…Discuss what it means to be “shrewd as snakes and innocent as doves” as Jesus commanded his disciples in Matthew 10:16. 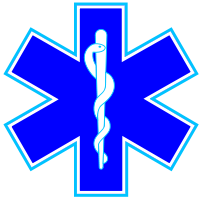 The Star of Life has become the internationally recognized logo of emergency medical personnel. Yet a snake on a rod seems like a strange symbol for healing and life-saving services. How did this sinister creature have its image so remarkably reframed? Subtle and crafty, the serpent was to become known as Eden’s infamous interloper and Master Botanical SpinDoctor. He could execute a disinformation campaign convincingly enough to sell ice to Eskimos. Or, fruit to those who lived among fruit trees. Or, dissatisfaction to those experiencing the highest quality-of-life index. He ever so carefully sowed seeds of doubt using false reasoning and half-truths, drawing Adam and Eve into whimsical delusions of grandeur while simultaneously arousing undue suspicion toward their loving Benefactor. Not only did his message effectively stimulate discontent, but the messenger himself was probably quite convincing. Adam and Eve had been tasked with managing the Garden, which included naming the animals that dwelt alongside them. They probably called various creatures to themselves, just as we call to our household pets of today. But this one…he addressed them. He seemed more “evolved” than the others. He could speak. He could reason. And how could he possibly know about the singular prohibition that God had given them? If this animal had found a way to become human-like, then he might actually know the secret of how humans could become God-like. A credible, yet ultimately flawed, conjecture. So serpentine whispers sown in the wind would reap curious thoughts. Curious thoughts would reap self-aggrandizing temptation. Temptation would finally reap an infraction of the only Law in existence at that time. And, the infraction of that Law would reap a whirlwind that would wreak havoc for millennia to come. In the short term, however, the beguiled and busted humans were immediately demoted from management to labor positions: manual labor for the man and birthing labor for the woman. And they were cast out of the Garden. As the old saying goes, “Sin takes further than you want to go, keeps you longer than you want to stay, and makes you pay more than you want to pay.” And sadly, sin also has corporate effect. Adam and Eve would not suffer its ill effects alone. The impact of this single act would reverberate throughout the ages and throughout the Creation. What started subtly would not end subtly. So what was up with this rotten serpent? And why didn’t the Garden Manager (Adam) just smash in his slimy head with a garden hoe right from the beginning? It all makes more sense if you are familiar with the prequel. This particular serpent was being innervated by a more malevolent being, unlike any ever encountered before by man or beast on Earth. In another time and place, Lucifer had thought himself equal with God. He had gathered a minority contingent of other angelic beings who ultimately failed in their attempts to usurp the power and authority of the Almighty. The consequences were disastrous. They become outcasts from heaven a.k.a fallen angels, a.k.a devils or demons. But Lucifer was as much a victim of faulty thinking patterns as he was a purveyor of them. He conceived that he might still emerge victorious somehow. Maybe a change of venue, maybe a change in species. After all, if you can’t get to Superman, you go after Lois Lane. Right? Make your own tracks…Check out Genesis Chapters 2-3 to read about the initial interaction of mankind with the serpent. Isaiah 14:12-14, Revelation 12:7-9, and Jude 1:6 provide some good material regarding the prequel story. Stay tuned. Next week, the snake is going to make a comeback. Matthew Henry’s Concise Commentary on the Bible waxes eloquent regarding this biblical scene and provides material far superior to my post. You can click the image to see a far superior icon. Among Time Magazine’s Top 10 Most Heroic Animals we find a little homing pigeon called Cher Ami. This unlikely conscript saved the lives of nearly 200 American soldiers of the 77th Division’s “Lost Battalion” in France during World War 1. After being shot to the ground, this little bird took flight once again to deliver the critical message that dangled from his bullet-pierced, little leg (that eventually had to be amputated). Mere pedestrians have long deemed their bipedal experience as merely pedestrian* and coveted the ability to soar. And one can only marvel at the hummingbird’s specialized hovering capabilities. Orville Wright stated that “learning the secret of flight from a bird was a good deal like learning the secret of magic from a magician.” Effortlessly and unknowingly, these tiny creatures employ the laws of physics to incite wonder in the minds of even the most brilliant engineers. In the Holy Scriptures, we find birds serving in unique capacities due to their much desired gifting. Perhaps they were Cher Ami’s avian ancestors that served as divine couriers to Elijah. The mighty prophet who could invoke fire to fall from heaven (1 King’s 18:37-38) or conversely request that rain cease to fall (James 5:17) with a single prayer from his lips was required to passively sit and await the arrival of his daily bread brought to him by ravens. 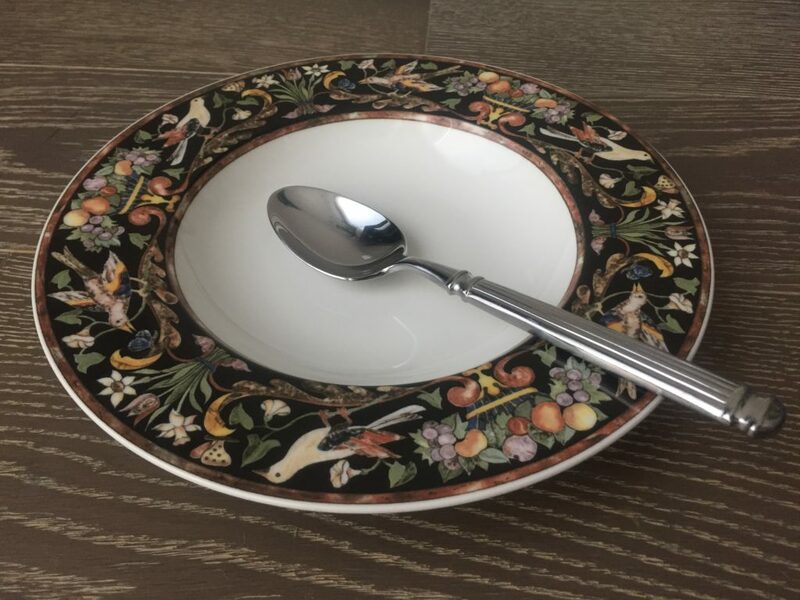 In Matthew 6:26 we find that birds are exemplary in their reliance upon God for provision, so it appears they were just passing the lesson along. In “The Art of War,” Chinese military general and philosopher Sun Tzu (~544–496 BC) observed that “birds rising in flight [are] a sign that the enemy is lying in ambush.” We also find cases of strategic birdwatching in the Bible. Though the historical characters of scripture could not fly, much could be inferred from a “bird’s-eye view.” While adrift on water as far as the human eye could see, Noah deployed a raven and a dove on surveillance and reconnaissance missions to determine if dry land and vegetation had resurfaced. (Genesis 8) Just as birds were used to indicate hope of a new Earth in Noah’s day, they likewise were utilized by Jesus to symbolically describe another time of renewed hope following worldwide calamity as described in Matthew 24:26-30: “Wherever there is a carcass, there the vultures will gather.” (v. 28) In context, this passage simply indicates that one will not need to travel around looking for Christ’s return; His re-entry will be evident to all who simply look up (Luke 21:28). Perhaps he chose this more ominous bird to foreshadow the ultimate renewal of all things because His appearing will transpire in the midst of great turmoil and wrath. I’m open to hearing other possible explanations. As it turns out, we are the creatures to be envied after all. **Agreed. That one was awful. Make your own tracks...Research the many references to birds in the Bible. What does God tell us about himself through them? Two thousand years pass. Then from the promised progeny of Abraham and Sarah, yet another son of even more miraculous heritage is born. And his path is about to intersect with that of a woman reminiscent of Hagar in several ways. She is apparently disenfranchised, living on the fringes of accepted society. She, too, arrives at a well, but she purposely travels there in the heat of the day. This unnamed woman seems to be more concerned about a different type of exposure. She has a story, in fact, several. She’s a regular in the tabloids of her day, and at midday, traffic is low around this 1st century water cooler. But also like Hagar, she has a lone Observer who is about to engage her in an unusual conversation. She had been exposed. He saw her and knew her. And she was quickly putting together clues regarding his identity, but he certainly challenged some of her assumptions during their interaction. Her particular preconceptions may sound foreign to us, but they can be easily refashioned into similar constructs held by those you know, or even by you. Jesus goes about setting the record straight though, in both word and deed. After all, Abraham’s original promise had concluded with the words,“through your offspring, all nations will be blessed.” (Genesis 22:18) As a Samaritan, the woman’s claims of Abrahamic heritage through Jacob (Abraham and Sarah’s grandson) were probably considered dubious to pedigreed Jews anyway. We see that Jesus quickly diverted her focus from bloodlines and sacred locations. His response to this woman echoed the truth that Hagar had learned. That Abraham’s provisions were only temporal. She was going to need something more substantial. That’s where the well comes in. Abraham’s blessing for all nations was also described as the Light of the World. Exposure to this Light is wherein expiation lies. For it burns with such great intensity that some who encounter it die immediately, only to be simultaneously refreshed by a peculiar Water that restores them to Life. The Light consumes everything, yet all that is finally lost is dross. “Is it easier to forgive sin or to open up my blind eyes? The Light is both terminal and transformational. And it burns through figurative fig leaves that are suddenly no longer found to be necessary. Eve was the first woman to find that fig leaves have insufficient SPF. *Lyrics from “Open Up My Blind Eyes” on Singer Sower by 2nd Chapter of Acts. Make your own tracks…At the end of Chapter 11 of “The Great Divorce” by C.S. Lewis, you can read about a ghost with a little pet lizard. Lewis’ friend, J.R.R. Tolkien, might have rewritten the haint to call the little creature “his precious.” See if you can determine how this story relates to the post above. Hagar was on the periphery of one of the most pivotal stories of human history. 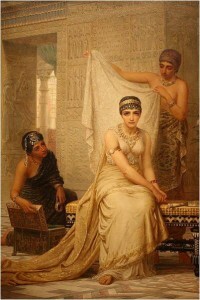 She was servant to Sarah, wife of Abraham. It had been revealed that Abraham and Sarah would miraculously conceive a son in their old age. And through this son, Abraham was to become the father of a nation — not just any nation, but the nation into which the Son of God would be born centuries later. This glorious promise eventually degraded into a desperately devised work-around, however, as the patience of all parties began to wear thin. To keep the story short and discreet…Years went by, and no baby. Sarah suspects they must not have read the fine print. She wrongly concludes that God must need her strategic planning abilities. So, she offers Hagar as a surrogate. Abraham obliges. Hagar conceives. Sarah is jealous. A cat fight ensues. The story continues though. Hagar indeed bears a son. But wait…Sara eventually births the child that was originally promised. Now there are two women, each with a son of Abraham — the patriarch through whom great inheritance and blessing will come. Things are about to get ugly again. Such are the scenarios that keep tabloids in business. But throughout the pages of the Bible we find that God’s plans are far more glorious than the people through whom they are implemented. He therefore continuously works out work-arounds of his own. Eventually Sarah is ready to be rid of her servant and, interestingly, God assures Abraham that yet another nation will come from Hagar’s boy but that he will need to let them go. Abraham provides some bread and water for their journey, then Hagar and her young son wander into the wilderness. Abraham’s provisions run out, but new provisions are about to be given. 15 When the water in the skin was gone, she put the boy under one of the bushes. 16 Then she went off and sat down about a bowshot away, for she thought, “I cannot watch the boy die.” And as she sat there, she began to sob. 17 God heard the boy crying, and the angel of God called to Hagar from heaven and said to her, “What is the matter, Hagar? Do not be afraid; God has heard the boy crying as he lies there. 18 Lift the boy up and take him by the hand, for I will make him into a great nation.” 19 Then God opened her eyes and she saw a well of water. So she went and filled the skin with water and gave the boy a drink. 20 God was with the boy as he grew up. He lived in the desert and became an archer. Once again, there is One who is watching and listening. 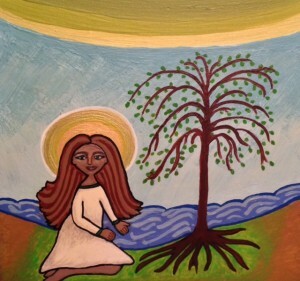 There is a moment of revelation, and Hagar’s eyes are opened to a well of water that would restore hope. Make your own tracks…Read Genesis 15-17, 21:1-21 for the full biblical backstory on this post. Don’t email me yet though. Part 2 is forthcoming. As a young man, Saint Nicholas was traveling by sea and the boat was overtaken by a storm. He prayed and the crew was amazed as the waters quieted. He apparently knew about the emergency procedure. Commonly known for his good deeds on behalf of the poor, he also became known as the patron saint of sailors and merchants. What do all of the following characters have in common? One is lost and alone, wandering in the desert. Perhaps due to poor planning, bad directions, or an unexpected detour. One is languishing in prison for crimes committed. He is receiving just penalty for his lawless misdeeds. One is experiencing acute suffering due to irresponsible behavior. Wiser decisions might have kept him from his pain and shame. One is a merchant marine at sea, struggling for survival in a raging storm. He was just doing business and living life, but God brought the storm upon him for unknown reasons. All the characters described in Psalm 107 are in dire straits, but each has reached his predicament in a different way. Some just happened upon their distress, and others found trouble on their own. How would you write the end to each of their stories? We can all root for the sailor to outlast the storm, emerging triumphant with a tale to tell his children and grandchildren. We can breath a sign of relief when the wanderer sees a city in the distance — finally, a destination where he will receive comfort and relief. But what about the criminal? Would we be satisfied to let him languish in prison? He’s just getting what he deserves, right? What about the foolish character? He didn’t do anything illegal, but he just should have known better! Hmmm. Maybe we would allow him to experience a miraculous recovery, but walk with a limp for the rest of his life — as a solemn reminder. Perhaps we don’t write stories with harsher endings for others, but for ourselves. Maybe we have resolved to suffer. Maybe we even deserve to suffer. Nevertheless, you have no crisis that has taken God by surprise. Follow the prescribed procedure. Then watch and wait. Modes of deliverance often differ as much as the nature of the distress. Sometimes the delivery is by degrees and sometimes it is by sudden emancipation. Sometimes the delivery is not seen; not absent, just not observable to the average onlooker. After all, the mysteries of God cannot be fully disclosed in a single chapter. In fact, the entirety of scripture does not provide any formulas or decision trees to predict divine acts. Sorry. *From “Jesus Lover of my Soul” by Charles Wes­ley, Hymns and Sac­red Po­ems, 1740. Leave your own tracks…Tell someone about your own stories of deliverance. About 10 years ago, I became a member of a book club, and our first assigned reading was “Love in the Time of Cholera” by Gabriel Garcia Marquez. In this story, a man named Florentino Ariza is to be wed in his youth to the beautiful Fermina Daza. But under the pressure and influence of other people and circumstances, she dumps him and marries a rich doctor instead. So Florintino waits in hope for 51 years, 9 months, and 4 days for Fermina’s husband to die so that he can get another shot at marital bliss with this woman. Though I finished off the book, I was unable to attend the meeting where it was discussed. I’m guessing, however, that the nature of longing was addressed at length. From where does the desire for relationship, romantic or otherwise, come? I love the answer posed by the well-known author and scholar, C.S. Lewis. He believed the experience of longing or desire to be an internal signpost pointing us towards the God of the Christian faith. Lewis’ conclusion necessitates a belief in a relational God, and indeed, the entirety of biblical scripture is a drama of relationship lost and restored. The story begins in a Garden where people walk and talk with the One who fashioned them to interact with Himself. But love cannot be forced. So He allows them to supplant relationship with their own ephemeral pursuits. Man asserts his volition, then furtively loiters among the flora and fauna where he used to stride in peace and confidence. Ultimately, the story ends in a City where the connectivity between God and man is reestablished, unimpeded by the sinfulness that made a mess of things in between. Of course between the beginning and the end, there is a lot of hope and longing for the Messiah, or Christ, who would repair the rift between an unholy people and a holy God. In the meantime, humans try to commune with God in their own sin-handicapped sort of way. Catching glimpses of the divine and longing for more. Nevertheless, when Christ finally appeared, he had to remind people who were caught up in rules that the first and foremost rule was one of relationship: to love God with all your heart, soul, mind, and strength. And that when you love God indeed, you will desire to live life within the parameters of that relationship. Now it’s one thing to love God; he is perfect in beauty, grandeur, justice, and mercy. He is worthy of longing. But what is more amazing is that He longs for us. In Christ we find a bridegroom who waits for his bride, with even a more perfect expectancy than that of the fictitious Florintino Ariza. *From “Love Divine, All Loves Excelling” by Charles Wesley, 1747. Leave your own tracks…The biblical story is concisely summarized in the lyrics of “In the Squalor of a Borrowed Stable” by Stuart Townend, who specifically references the biblical Bride and Her Lover. There are several arrangements of this song that you may want to explore. What if you were charged with the task of defining the word “wisdom”? Really. All the nuances of this term are difficult to capture, at least in a concise way. How is wisdom different than intelligence? What is the role of life experience in the acquisition of wisdom? How is wisdom accessed, and what does it look like when actualized? Some abstract concepts connote so much meaning that words do not suffice to describe them. So the Creator gets creative once again, painting pictures with words penned by Solomon. 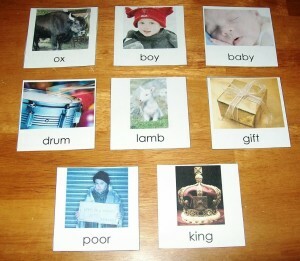 Together, words and images coalesce to activate the mind, imagination, and experiences of the learner. 20 by his knowledge the watery depths were divided, and the clouds let drop the dew. Wisdom is nothing if not implemented. It is never just an idea or philosophy in isolation. “Wisdom is proved right by her deeds.” (Matthew 11:19) Wisdom must be acted out by a living agent, so perhaps this is why the literary technique of personification is employed. And we find that wisdom is to be desired, but not as a purely intellectual pursuit. More than that, it’s aesthetically pleasing, it’s relationally soothing, it’s physically nourishing. And even more, we find that it’s the powerful force by which the foundations of the earth were forged. Who may wield such a powerful force? Despite its experiential nature, we find that wisdom is not always gained through the accumulation of years. Nor disseminated through the abundance of words. Just ask Job. If you read his story, you find that his aged (and perhaps well-meaning) friends were less than impressive in their attempts to help. The younger Elihu finally intervened, demonstrating that sometimes wisdom must take initiative — sometimes it must confront. By it’s very nature, wisdom must somehow be expressed. 6 So Elihu son of Barakel the Buzite said: “I am young in years, and you are old; that is why I was fearful, not daring to tell you what I know. 7 I thought, ‘Age should speak; advanced years should teach wisdom.’ 8 But it is the spirit[b] in a person, the breath of the Almighty, that gives them understanding. 9 It is not only the old[c] who are wise, not only the aged who understand what is right. 10 “Therefore I say: Listen to me; I too will tell you what I know. 11 I waited while you spoke, I listened to your reasoning; while you were searching for words, 12I gave you my full attention. But not one of you has proved Job wrong; none of you has answered his arguments. 13 Do not say, ‘We have found wisdom; let God, not a man, refute him.’ 14 But Job has not marshaled his words against me, and I will not answer him with your arguments. 15 “They are dismayed and have no more to say; words have failed them. 16 Must I wait, now that they are silent, now that they stand there with no reply? 17 I too will have my say; I too will tell what I know. 18 For I am full of words, and the spirit within me compels me; 19 inside I am like bottled-up wine, like new wineskins ready to burst. 20 I must speak and find relief; I must open my lips and reply. 21 I will show no partiality, nor will I flatter anyone; 22 for if I were skilled in flattery, my Maker would soon take me away. *From “Be Thou My Vision.” Words: At­trib­ut­ed to Dal­lan For­gaill, 8th Cen­tu­ry (Rob tu mo bhoile, a Com­di cri­de); trans­lat­ed from an­cient Ir­ish to Eng­lish by Ma­ry E. Byrne, in “Eriú,” Jour­nal of the School of Ir­ish Learn­ing, 1905, and versed by El­ea­nor H. Hull, 1912, alt. 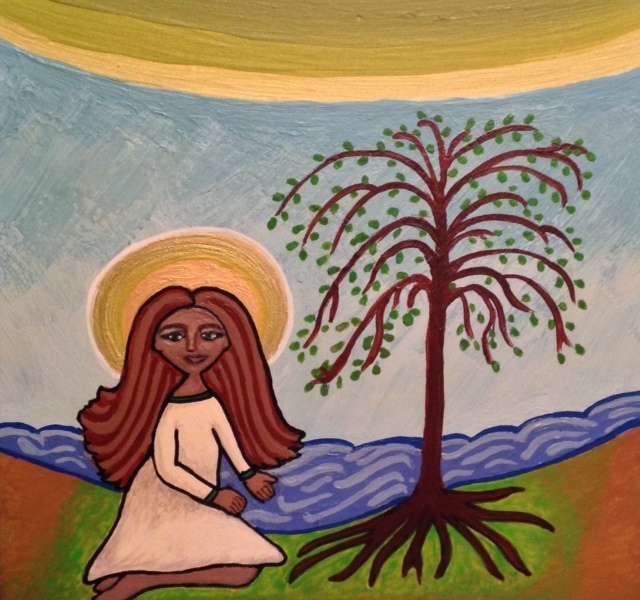 Leave your own tracks…Try painting (or drawing) an image representative of a complex biblical concept. Such a warm pronouncement, yet Mary was “greatly troubled…and wondered what kind of greeting this might be.” (Luke 1:29) She had been chosen to bear the long-awaited Messiah — a great honor for certain! And those moved by the Spirit knew it. Upon seeing Jesus in the temple courts, Simeon praised God for the appearance of a Light that would let those who would see it find their way out of darkness. He then gave Mary a blessing somewhat curious to our ears, “This child is destined to cause the falling and rising of many in Israel, and to be a sign that will be spoken against, so that the thoughts of many hearts will be revealed. And a sword will pierce your own soul too.” (Luke 2:35) Mary was going to experience the bittersweetness of being favored in a fallen world. Her reputation was questioned due to Jesus’ supernatural conception. She endured travel to Bethlehem on a donkey late in her pregnancy. She surely grieved the deaths of the 300 other children born in Bethlehem as Herod sought to kill hers. Her new family was soon displaced after the birth as they fled to Egypt. Her son’s ministry was controversial among the religious leaders of Israel (as Simeon predicted), as well as within her own household. She eventually watched her son be unjustly and cruelly executed. But joys, victories, and wondrous miracles were interspersed among these sorrows. Bittersweet is an apt term to describe the outpouring of Mary’s favor, for her blessings ran counter to the nature of the fallen world around her. 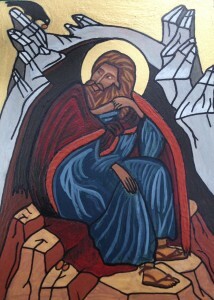 In fact, both “bitter” and “sweet” are terms used to describe the hard prophetic messages given to the prophets Ezekiel and John. Being commissioned by the God of the universe to deliver a message is certainly both glorious and sweet, but the delivery of the message to a hostile audience can be, well, bitter. And Jesus’ life bore out the fullness of this reality. Just as Mary knew Christ in his sufferings, however, she also knew him in the glory of his resurrection from the dead. And, perhaps it was even the bitterness of circumstance that maintained her sweetness. Much like Paul who found that thorns brought with them humility and a reliance on the grace of God, and his weaknesses showcased the power of Christ. What bitterness compares to the sweetness of having known and been known, loved and been loved, by the God and Creator of the universe? *From “When I Survey the Wondrous Cross” by Isaac Watts. Leave your own tracks…Make a comment or contact me at thelyoness@literatelyoness.com. Also take a look at Star of Bethlehem Documentary 2007 – Rick Larson on YouTube.